Today is the Lunar New Year marking the start of the year of the Earth Dog and 15 days of celebration. I would like to wish everyone who is celebrating a joyous new year filled with happiness, prosperity and good health! Gong Hei Fat Choy! Gong Xi Fa Cai! 新年快樂! 恭禧发财! We will be observing our annual tradition of visiting the Buddhist temple to mark the new year. The dog (狗, gǒu) is the eleventh sign in the 12 year cycle of the Chinese zodiac. Those born in 1958, 1970, 1982, 1994, 2006, 2018 are born in the year of the dog. You are friendly, smart, loyal and responsible. Your lucky numbers are 3, 4 and 9, and your lucky colors are green, red and purple. This editorial features gorgeous Chinese actress Li BingBing as captured by Chen Man for Harper's Bazaar China's 24th Anniversary issue in a stunning concept of Poetry and Painting and Flaming Lips that juxtaposes traditional and modern glamour. 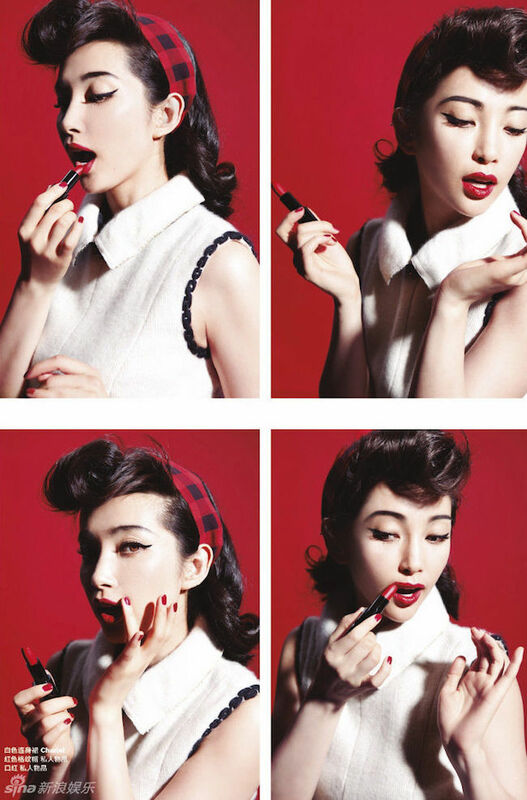 Li BingBing looks so stunning on this editorial. Great styling! Chen Man did a wonderful job with the photos. Wow, these looks are all Stunning. Happy New year to you dear. I wish you a year filled with lot of happiness prosperity and joy. She looks a lot like Jackie Kennedy (style wise) in the first picture. Happy Chinese New Year, Rowena. Happy Chinese New Year Rowena! Wishing you & your hubby much blessings! I love this editorial! How exquisite! I've seen Li BingBing and she is always so eloquent. Wow these editorials are so stunning. And they remind me and make me think of what is happening to the publishing industry so sad. I mean blogs are great but no blogger will ever create editorials like this. It is a special world that is sadly not going to exist it seems in the future. OMG! She is so amazing and stunning! Happy New Year Rowena! Wising you all the best. I am a tiger and curious now about my lucky numbers! She is gorgeous! I love her confident expressions on top of her natural beauty. This editorial is everything!!! Happy New Year to you Rowena. Great characteristics of those born in the year of the dog! You always keep me current, Thank you for that. I was born in the year of the dog which means lots of challenges and changes for me, and I’m 100% ready. Li BingBing is stunning. These photos are all absolutely gorgeous. Happy belated new year! I've never really thought much about my animal or numbers, but I'm definitely considering taking time out to do some proper research now. Happy Lunar Year dear! I wish you much happiness and prosperity in the year of the dog. Aww Li Bingbing looks stunning! I hope you and your family had a wonderful Lunar New Year!